Like other crafters out there, I’m sure, I have a huge pile of scraps that are more than just left over pieces of cardstock when I cut out a shape from a sheet. But I have stamped images I decided not to use for one reason or another, punched images that I played with and set aside, and even card bases that I cut knowing they would be used sometime. Well, I finally decided to do something about these random one-off pieces and started putting together some cards using them – including this card. This is a cute set called On a Pedestal that my mom got at one point that I just had to try out. It is a “2 step stamping” set where you get a stamp of the pedestal and then different items you can layer on top, like a yummy cake with a cherry on top! I grabbed this image and matted it and then started digging in my scraps for more pieces to go with it. 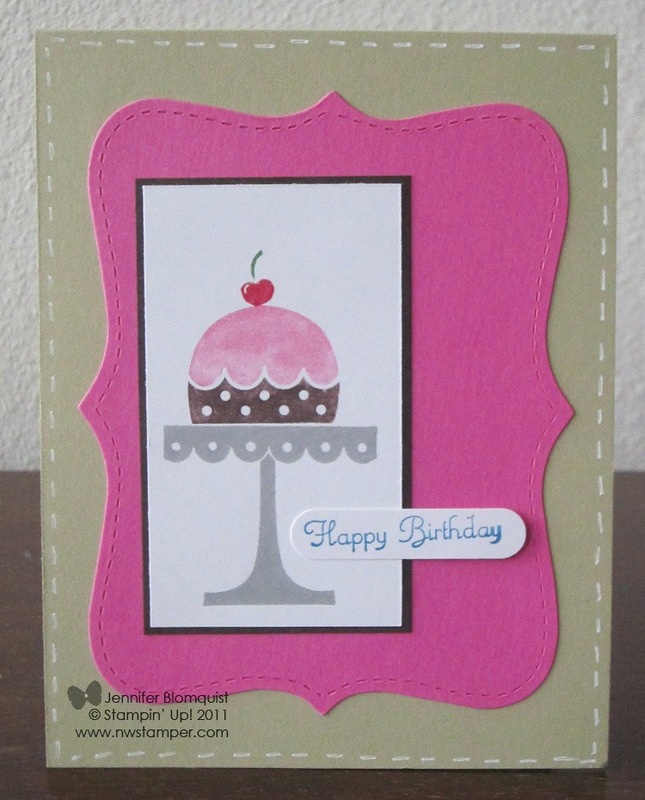 I had the Pixie Pink Top Note bigshot die cutout and the Happy Birthday stamped image (using the Create a Cupcake stamp set), so I layered them onto the River Rock card base. When I was done, it still looked a little plain so I decided to try some faux stitching and grabbed my Signo white gel pen and added a little touch to the edge. Fishy Best Wishes to You! Thursday night I held my first event with my new Bellevue/Redmond Card Makers meetup group. We had a small group but it was fun to meet some local gals and great to have the forced motivation to get my craft room unpacked! I’ll admit it, I didn’t get the craft supply boxes opened until that morning. :) Thankfully, I knew I had extra supplies from the card we did for my last get together in CA, so I didn’t have to do design work, just find and gather the supplies. I found this card on Lyssa Zwolanek’s blog and loved it so much I had to share it with others. Isn’t he just the CUTEST?! The fun part is that this card uses some punches in very non-traditional ways. 1. For the body, I used an ornament stamp from the Delightful Decorations stamp set and punched it out with the Ornament Punch. 2. Then I punched out a flower using the 5 petal flower and trimmed off the petals to use for fins. 3. Then I used the 1/2” circle punch and the 3/16” punch on my Crop-a-dile for the bubbles and eye. Fun, huh? Give it a try and you can have your own cutey fish too. Need one of the punches or supplies? You can get it now in the online store. Hello again! Thanks for visiting again after my recent blog hiatus! :) For those of you that didn’t know, I just finished a big move from California to Washington state. Its been a crazy couple of weeks for finishing getting ready to go, driving myself, my hubby, my son, and 3 cats in a minivan up to the Seattle area, and then wading through too many boxes! I still don’t have my craft room really unpacked, but I do have a bunch of projects that I can’t wait to share with you! See I was smart, I finished a bunch of cards before I left and then I kept those projects out and with me so I could share photos when I had a chance post move. Plus there have been a ton of new promotions and cool things Stampin’ Up! launched at the beginning of the month. So, I’ll try not to overwhelm you in this post but will share lots of projects and info this week while I finish getting my craft room in working order again. So, to start you off, I thought I’d share a card I did for a swap at my team meeting last month. 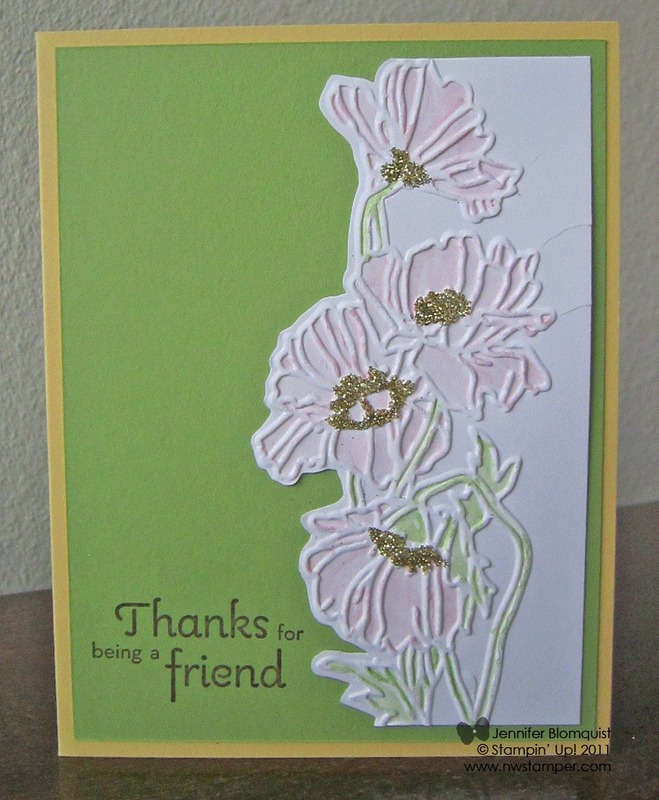 It uses the new Flower Garden embossing folder from the Summer Mini. This is actually a really simple card to make… ok, assuming you count cutting around the embossed flowers simple… but otherwise, really easy to do! I embossed a piece of Whisper White paper with the Flower Garden embossing folder. Then I trimmed away the paper on the left side of the flowers. I used an aqua pen to color in the flowers and then added a bit of bling by using a 2-way glue pen to add adhesive to the center of the flowers and sprinkling with gold glitter. 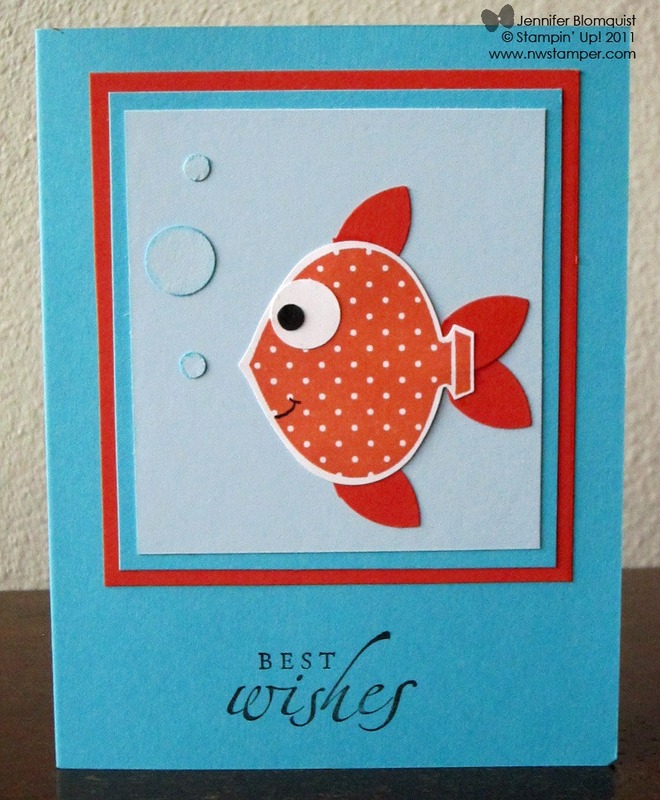 Attach to Pear Pizzazz paper and a So Saffron base and you have a fun and different card.